The little greenhouse was built by my husband 5 years ago. Nearly all of the structure was built with recycled or reclaimed material–we are pretty proud of that. The greenhouse is 10 X 10 ft square. The greenhouse is wired and we heat or cool with electricity. I use passive heating also–the greenhouse sits on a bed of sand, gravel and cement pavers. Black buckets filled with water also sit under the benches. All of these together–absorb heat during the day to help night temperatures. There is maintenance with a wood structure. Painting! But it’s worth it! If you want character in your garden landscape–you can’t get anything better! When you live in zone 4, a greenhouse sure helps jumpstart your gardening. As I sit here with a blizzard raging outside my window, I am counting the days till the greenhouse is warming and nurturing the next seasons plants. Love your greenhouse your hubby built. Great job, hubby. I love the color you painted it too. What is the name? It’s a very cold windy here today too. Thank you Karen, I had wished for one for a very long time….it was a fun family project! It was on the 2014 cover of Country Gardens magazine! What a honor, and so fun to share with other gardeners. The color was a careful decision, it’s a Dutch Boy color called Pumpkin Stem. Look at the door pull! I hunted and hunted for something for the door handle. Than found just the right old trowel! What a labor of love, so carefully crafted! It was a family project, but blessed to have a husband with carpentry skills. He never draws anything out. Just has it in his head. Feel very lucky to have the little charming greenhouse as the centerpiece in my garden. Thank you Eliza, so lucky to share it with so many garden friends! It’s a beautiful structure. I love the re-used materials, especially the door handle! So glad you enjoy seeing the little greenhouse. It is sturdy and does an amazing job nurturing my little seedlings. That is what I think I’m most proud of –its a real working greenhouse, not just a decoration in the garden. I dug through lots of boxes of “stuff” at local antique shops and scored that little trowel! I knew the minute I saw it–perfect for a door pull! Thank you for stopping by the garden. Hi Stacey, Hey? Who’s new puppy is that in your Instagram? Very cute! Hard to imagine your Cottage is 10 x 10, it looks a ton bigger. Sorry to hear you’re having a blizzard. Whe’re coming off a big cold snap too. Looks like half of North America is suffering weather. Look how tall your seedings are already. What did you start there on the bottom shelf? Okay – Now I am just jealous. . . 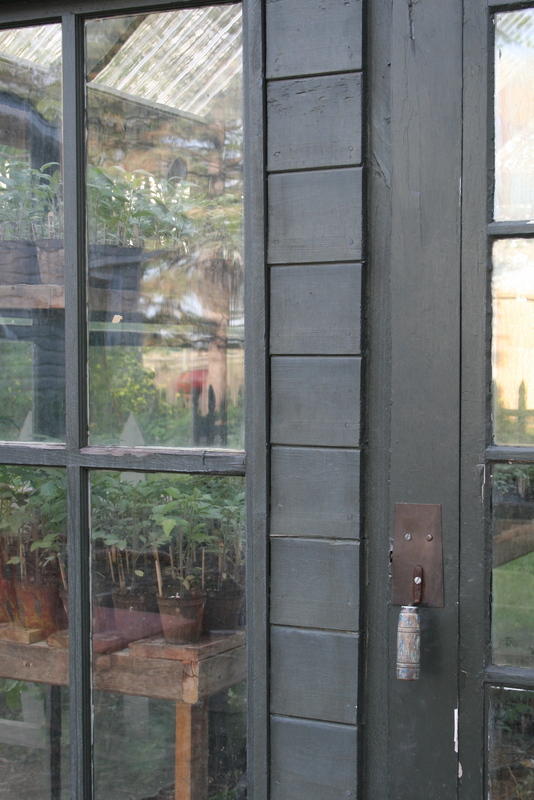 Your greenhouse is awesome – and so nice to know that your husband built it with reclaimed materials. I am sure it is a great feeling to use it so much. . .